This term our new topic has been ‘Travel Agents’. 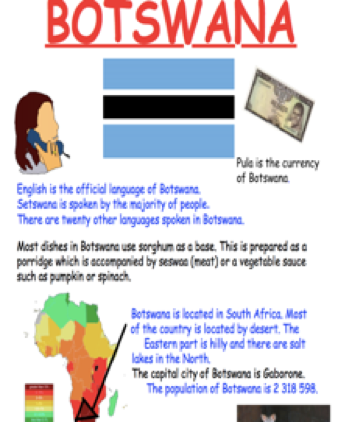 As this was a Geography themed topic, we focussed on the immediate locality and Botswana. The children completed their own ‘KWHL’ grids (What I know, want to know, how I will learn and what I have learnt) and have asked some fantastic questions this has given them real ownership of the topic and allowed them to lead their learning. This has involved the children carrying out a lot of independent research. Year 4 have really enjoyed researching about life in Botswana and how it compares and contrasts to life in Wales. Through this topic we were able to consolidate some of the Maths skills taught this year, like reading and interpreting graphs. This topic has been a great way of focusing on reading behaviours such as activating prior knowledge and questioning. We’ve read and comprehended several texts to gain a better understanding of Botswana, its climate and the wildlife that lives there. The children have had lots of fun outdoors this term, as our Science topic has involved searching for habitats and minibeasts in the forest and school grounds It gave the children a real appreciation of how lucky we are to have fantastic facilities at our school.